Doujun is an NPC in Sekiro in the Abandoned Dungeon, and he’ll ask you to find one tough man and hand you the Surgeon’s Bloody Letter. This kicks off a whole chain of side quests. However, people have been wondering where to find one tough man for Doujun in Sekiro. If you’re one of them, here’s our Sekiro Doujun NPC – Surgeon’s Bloody Letter Item – Where to Find Tough Man guide to take you through the whole quest, step by step. Before we go any further, though, SPOILER ALERT. We’re gonna spoil the hell out of this quest chain and everything related to it. Proceed at your own risk. To find one tough man for the Doujun NPC in Sekiro, there are two locations that you can go to. The first one is at the very entrance to Senpou Temple from the Abandoned Dungeon. Basically, just continue through the area until you reach a lift. Go up, climb the stairs out of the cellar, and head through the open double doors. Immediately go to the right and drop down. Talk to the big fella sitting next to a tree and crying. His name is Kotaro, and he’s one of the candidates to be sent to Doujun. The other tough man that you can send to the Dungeon to Doujun is Jinzaemon Kumano. To find him, go to the Ashina Reservoir idol. Climb the wall opposite the idol, then jump and grapple to the large branch across the chasm. Jump up and over the wall above, and go around the wooden fence. Jump off the cliff, then quickly turn right and grapple to the other side. You’ll spot Jinzaemon looking into a hole. 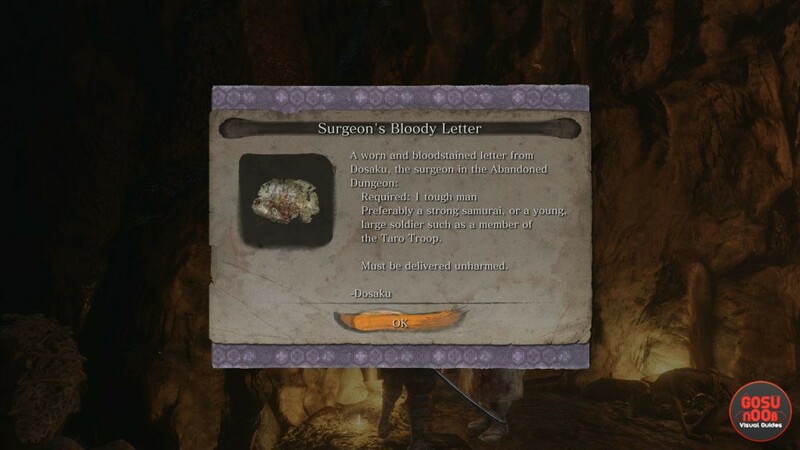 What to Do With Doujun Surgeon’s Bloody Letter Item in Sekiro? You can’t really do anything with the Surgeon’s Bloody Letter per se; all it does is to open dialogue options with either Kotaro or Jinzaemon, allowing you to send them to Doujun. However, before you can send Kotaro to the dungeon, you have to give him the red-and-white pinwheel. If you give him the white pinwheel, the quest goes in a whole different direction. Check out our Kotaro NPC Full guide for further details. Anyway, hand him the red-and-white pinwheel, and then select the Lure into Dungeon option. Jinzaemon, on the other hand, is a lot less picky. All you have to do is talk to him. If you have the Surgeon’s Bloody Letter on you, the option to lure him into the dungeon will present itself as you go through the dialogue. You get to choose who you send. Whatever happens from this point on will be entirely your fault. Yay. How to Continue Sekiro Doujun Quest Line? To complete Doujun’s quest line in Sekiro, after you send either Kotaro or Jinzaemon into the dungeon, go back to Doujun, and you’ll get three Lumps of Wax. Then, go to an idol and rest, and go back and eavesdrop at the gate. Then, go and complete the Ashina Depths area by killing the ghostly Corrupted Monk and getting the Mibu Breathing Technique skill. Then, return to Doujun once more. He’ll seem very much in distress, and will task you to go and kill a red-eyed carp in the pond in Mibu village. Where to Find Carp with Red Eyes for Doujun? To find the carp with red eyes for Doujun in Sekiro, you have to go back to the Water Mill sculptors idol in Mibu Village, in the Ashina Depths region. Go straight, and jump into the lake to the left. Dive down and keep going to the left, and you’ll spot the carp’s red eyes glowing from quite a distance. Kill it, and you’ll receive the Red Carp Eyes item. Go back to Doujun, give him the eyes, and you’ll get two Lumps of Grave Wax. The quest is still not over, though. Doujun Quest in Sekiro – How to Complete? To complete Doujun’s quest line, after handing him the Red Eyes, go and rest, and eavesdrop at the gate again. Go and rest once again, then proceed to the elevator leading to Senpou Temple, but don’t use it. Instead, go left from it. Jump into the water and dive down, and head left through an underwater gate. Swim up and grapple on top of the ledge, and proceed forward to find and speak to Doujun. Exit through the gate behind Doujun, and loop back into the lake, but this time, don’t dive. Instead, swim over to the island in front of you, and there, you’ll have to fight a demonic-looking Kotaro or Jinzaemon, depending on who you sent there. For killing them, you’ll get the Red Lump item. Now, go and rest again, then go back to the island where you fought Kotaro or Jinzaemon. You’ll then be able to kill a demonic Doujun. When the battle is over, you’ll get an Academic Red Lump. The last step of this sordid tale is to go back to the cell through the underwater gate, and find what is to be found, if you haven’t already when you were there first. Hope it was worth the trouble. Where to Find Doujun NPC & Surgeon’s Bloody Letter in Sekiro? To find the Doujun NPC in Sekiro, you just have to look a little closer near the entrance to the Abandoned Dungeon area. From the Abandoned Dungeon Entrance, head down the slope, then use your grappling beams above. Go forward until the only way to go is left. Then, head left and look below you. You’ll see Doujun standing next to a gate. Hop down and say hi to receive the Surgeon’s Bloody Letter item and kick off the quest chain. Looks like, if you die to Kotaro / Jinzaemon first time around, next time you go back demonic Doujun will be there as well. You can pop a Gachiin’s and sneak up behind him so you don’t have a 2 on 1. Jinzaemon is afraid of fire (not sure about Kotaro). Using Suzaku’s Lotus Umbrella will cause him to cower long enough to get 5 – 6 hits in.